Zhongguo Hua Tuoguan sits in a part of Kuala Lumpur I think of as 'Little China'. Changkat Thambi Dollah Street is home to a Taiwanese snack shop, a sometimes authentic Sichuan restaurant (and its competitor in the lajiao stakes just across the street), and a shopfront that turns out wonderful renditions of homestyle dongbei (northeastern Chinese) cuisine. This area seems to be a magnet for Mandarin-speaking recent immigrants to Malaysia. So much so that sometimes it reminds me of China, without the spitting. The restaurant's entry, with its two golden urns of 'Herbal 24 Cooling Tea' displayed front and center, is hard to miss. 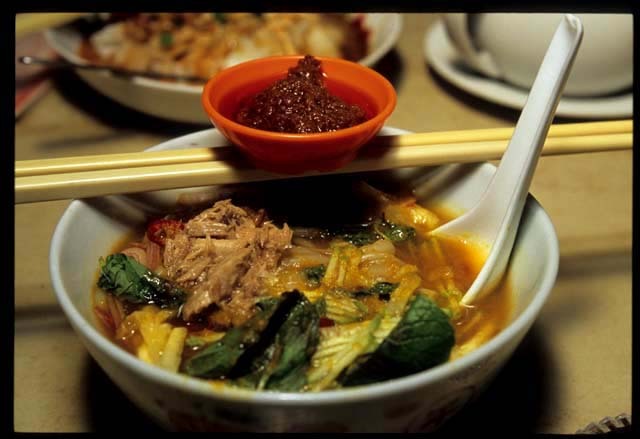 Yet as often as we find ourselves in this part of KL, we'd never given the place a second glance ... until a hand-lettered sign hawking nyonya asam laksa showed up on the sidewalk out front. Despite our residence in the country that laksa built (or is it the other way around?) we're just not getting enough of these exquisitely chewy rice noodles in our diet, so the placard drew us in. ZHT's interior might have been the work of a split personality. The low lighting, miniature Chinese lanterns, jars of medicinal herbs and teas displayed on wall shelves, and soothing, days-gone-by Chinese music tinkling in the background are reminiscent of a Hong Kong-style Chinese teahouse. 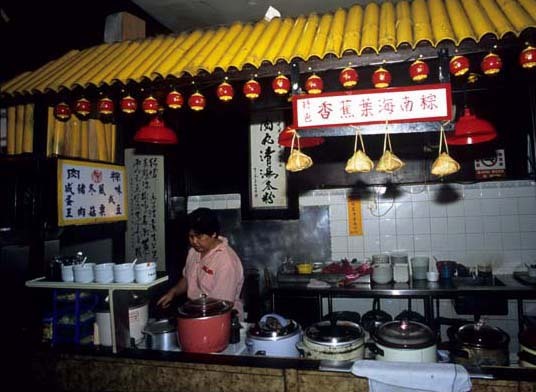 Faux bamboo 'roofing' over the prep station and leaf-wrapped Hainan zongzi (glutinous rice dumplings) suspended over crock pots of congee, laksa soup, and coconut curry suggest a more rural setting. Living up to its self-billing as 'The Specialist in Herbal Health Care', ZHT offers a long list of herbal teas (in addition to the '24 Cooling', there's Guiling Herbal Powder) and tonics (wild ginseng and snow frog), in addition to 'Light Meals" (fried glutinous rice Hong Kong style, shen xian porridge) and desserts (we'll get to that later). Asam laksa purists will no doubt be disappointed with this bowl. 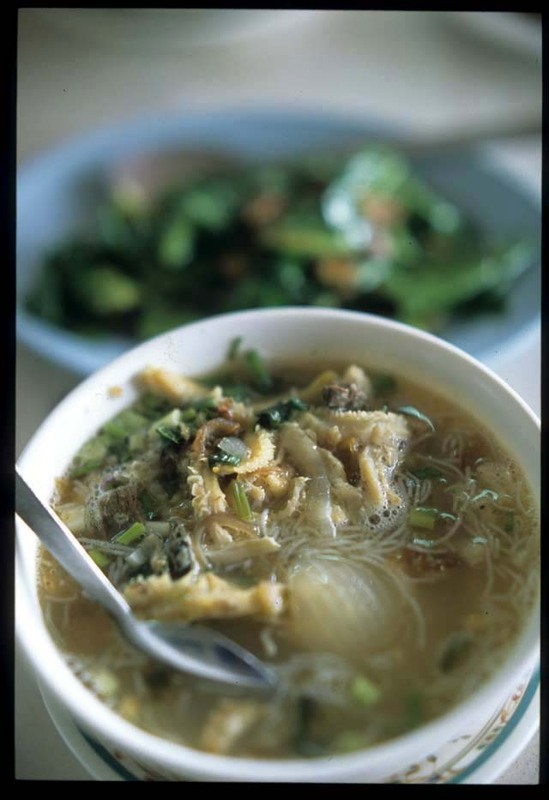 Though plenty asam (sour) and spicy, the soup is light on the shreds of fish that give the dish its characteristic body, and the chunks of fish mounded on top of the noodles appeared to be canned mackerel or some such. But those with a tolerance for canned piscene products, who are willing to set preconceptions aside and recognize this version for what it is (asam laksa prepared by a non-specialist in a restaurant focused on Hong Kong-style snacks and drinks), will delight in the toothsome noodles drowned in surprisingly zippy broth, topped with shreds of cucumber and sweet pineapple, red onion slices, and fragrant mint leaves. ZHT's sambal is no slouch either, with a nice hint of sweetness playing off its fiery pounded chilies. When I next crave asam laksa I might not head to ZHT, but when I next find myself at one of ZHT's tables I may well order the asam laksa. Chicken and mushroom chee cheong fun (rice noodle rolls) are delectable, if a bit over the top, following on the heels of a full bowl of laksa. Slivers of black mushroom and tender filaments of chicken breast shredded right to the fiber top a generous bowl of wide noodles doused with red coconut curry. The tongue-tingling curry's coconut cream count is high, very high, making this one lusciously lemak (fatty/creamy), but awfully filling, bowlful. Desserts -custards and herbal jellies, displayed in a refrigerated case to one side of ZHT's entry -should not be missed. 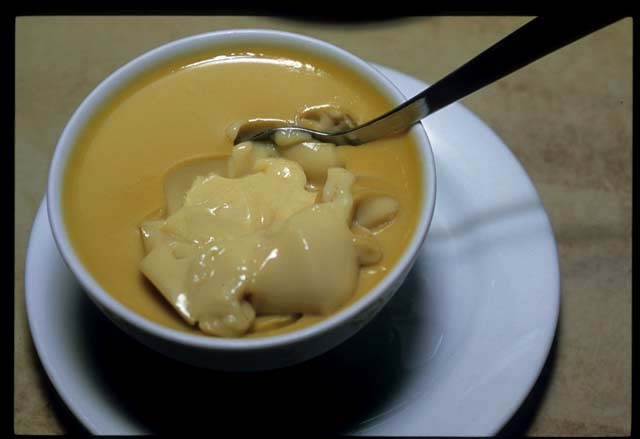 Corn custard, a firmish (and unphotogenic) golden square is the absolute essence of sweet corn, boosted by eggs and a bit of sugar. It's taken me a decade or so of eating in Asia to come around to the idea of corn as a dessert ingredient, but this treat makes it seem intuitive. 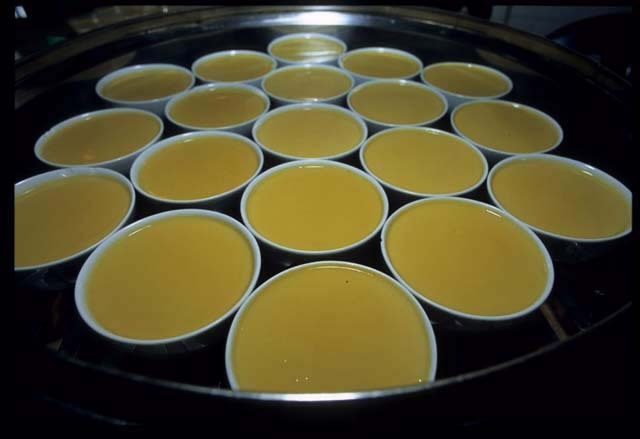 Kudos to ZHT's superb steamed egg custard, jiggly and silky and light as a cloud. Capped with a thickish, glassy skin that miraculously disappears when a spoon breaks its surface, this custard is all about the egg - or, more precisely, the yolk. A spoonful shows nary a trace of vanilla, and sugar is kept to a minimum. I've enjoyed more than a few memorable panna cotta, creme brulee, pot de creme, and plain old puddings in my time, but in terms of texture (that is, non-texture) and simple, unfettered eggy lusciousness, this delight beats them all. We'll be returning for this one. 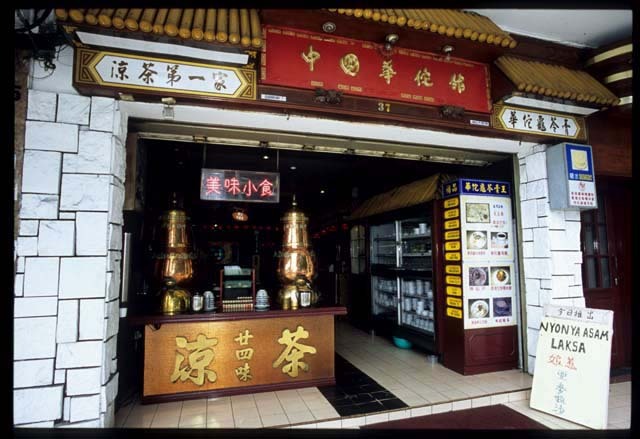 Zhongguo Hua Tuoguan (Mandarin), Changkat Thambi Dollah (2 blocks behind Berjaya Times Square and the Imbi monorail station), Kuala Lumpur. Look for the white building with red signage, sandwiched by Fong Wah Teowchow Porridge on the left and Restoran Sri Pudu Nasi Kandar on the right. Open 10am-1am everyday. A very full meal for two (2 bowls of laksa, 1 chee cheong fun, 2 desserts, and 2 iced teas) about 30 ringit. Here in Kuala Lumpur we do our day-to-day shopping at a covered, dry 'wet' market. It's roomy and well-organized (seafood in one section, lamb and beef in another, chicken in a corner and pork tucked away downstairs in the parking garage; Chinese and western vegetables here and Malay and Indian veggies further up the row; fruit across from the dry goods provisioners and newspapers opposite the soy products lady) and the aisles are kept clear and clean. Now that I know the lay of the land and have identified my favorite sellers I can draw up a list, zero in on ingredients with minimal distraction, and be home with my laden basket in about an hour. When we travel it's a different story. Over the years food, and food markets in particular, have become our wandering raison d'etre. And for strolling, browsing, bargaining, taking photos, and sampling local treats nothing beats a jumbled market open to the sky. We'll never turn our nose up at a covered market, but it's outdoor markets, with their barely controlled chaos and confusion, that we love. We don't mind dodging suppliers carting piles of produce, blocks of ice, or bags of dry goods on their backs and shoulders, wincing at the high-pitched cries and shouts of vendors, or jostling with other customers as we pick our way around baskets of seafood and produce placed here and there with little regard for order. Open-air food markets are a visual feast, an olfactory cornuccopia, an aural bounty; they're what gets us out of bed before dawn and on the road without a shot of caffeine. Whether we're a short drive or several time zones from home, any day that we've managed to spend an hour or two (or, preferably, four) at an outdoor food market is a good one. 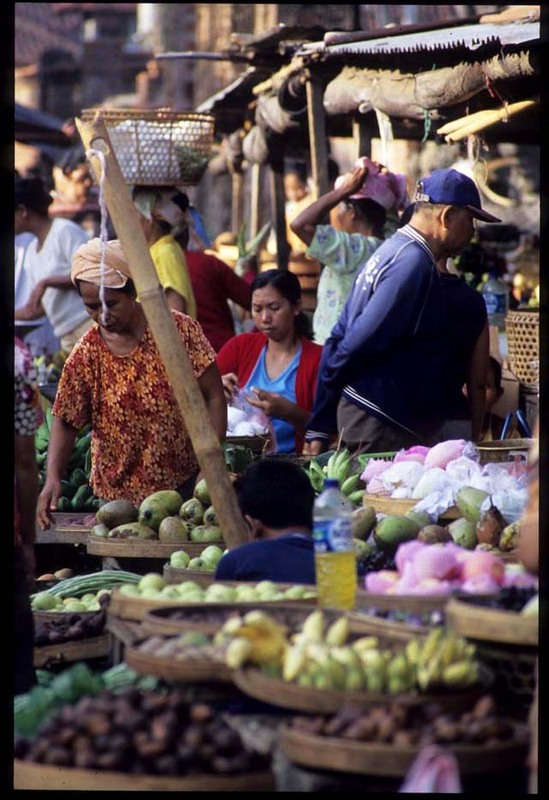 This morning market in northern Bali's Buleleng district sits literally at a crossroads, a four-way intersection on the road connecting the town of Kaya Putih to the coastal city of Sererit. Early each morning it comes to life, inside a two-story covered building across from the village temple and outside on the streets in front, stretching a block or two in three directions. 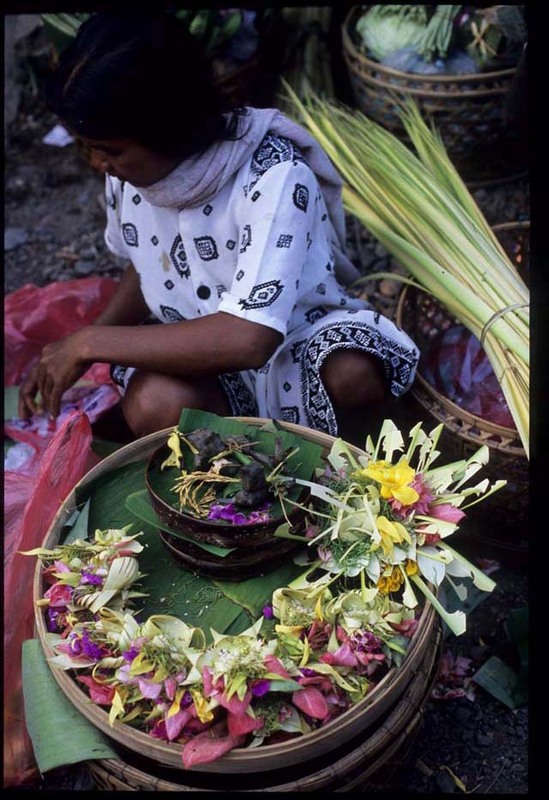 On Bali, religion is everywhere; a good portion of every market is devoted to offerings made of fresh flowers, plants, woven leaves fresh and dried, food. As markets go this one is really rather small, but there's a lot of hustle and bustle packed into its limited area. 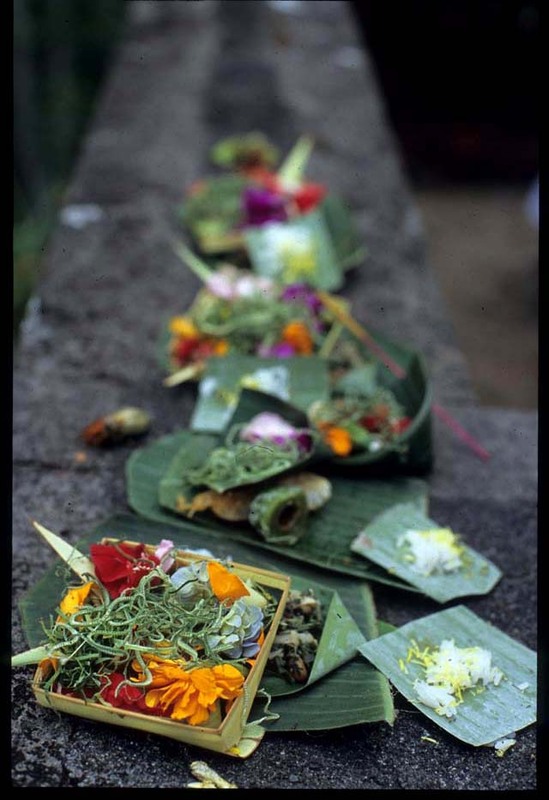 On offer, almost anything you'd want for a Balinese meal -- banana stems and star fruit leaves, turmeric and ginger, garlic and galangal, Balinese 'bay' leaves and chilies, grated coconut and soy beans. 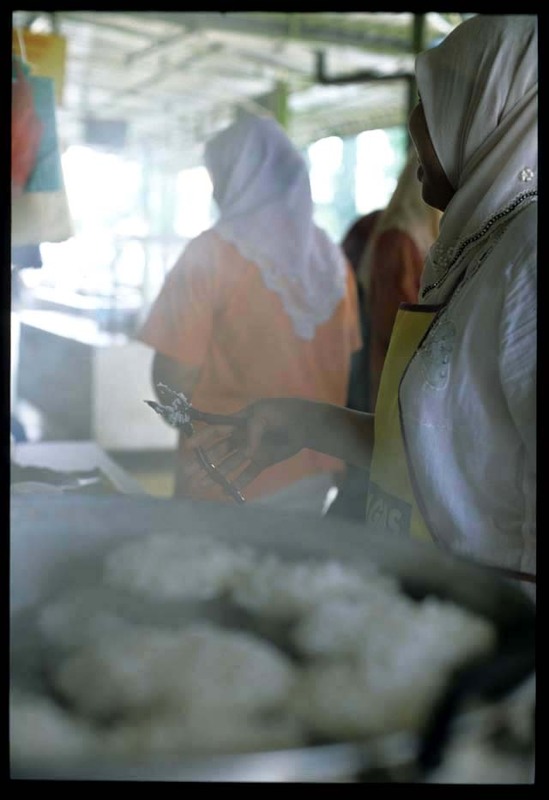 Because the market is inland, there's not much in the way of fish or seafoood other than what's been salted and dried. We'd driven here in search of white mangoes, a rare (and thus relatively expensive) variety, in season on Bali from around January to the end of March. They're big and heavy, with thick green skins that vary from yellowish to dark as a Haas avocado. Inside, juicy white flesh with a strangely vegetal flavor, something like a cross between a cucumber and a tomato, with a spoonful of sugar thrown in - delicious in their own right, though nothing at all like what one expects from a mango. Bananas are big on Bali. We counted at least ten varieties at this market alone. 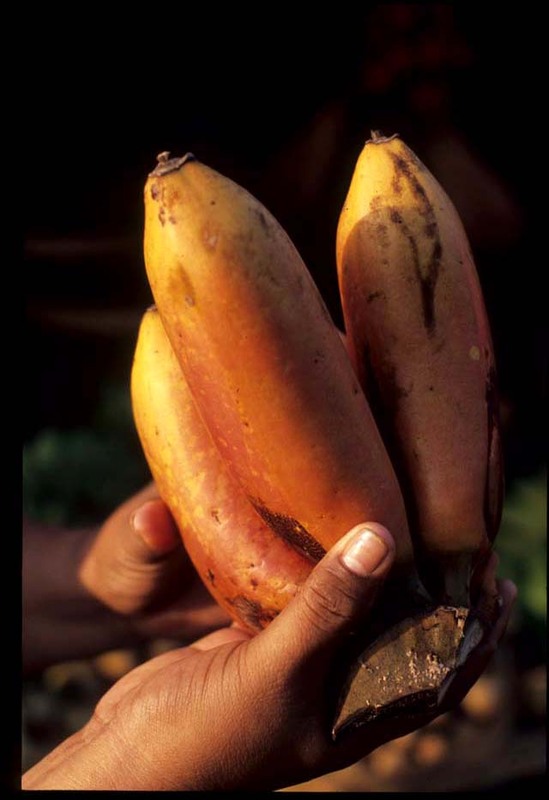 Some are hard and green, destined for coconut rice puddings and desserts sweetened with palm sugar. This red-tinged variety is exceptionally sweet, with a hint of strawberry flavor. 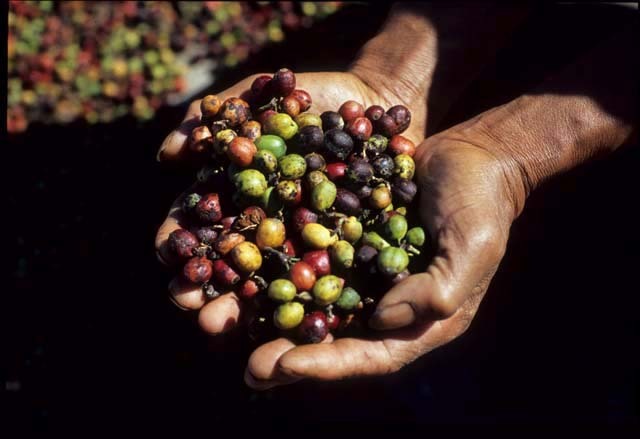 This market is set squarely in Bali's coffee growing region, so it's no surprise to find freshly picked coffee cherries on offer, ready for drying and roasting at home. Perhaps this market's downside is its limited selection of prepared foods. 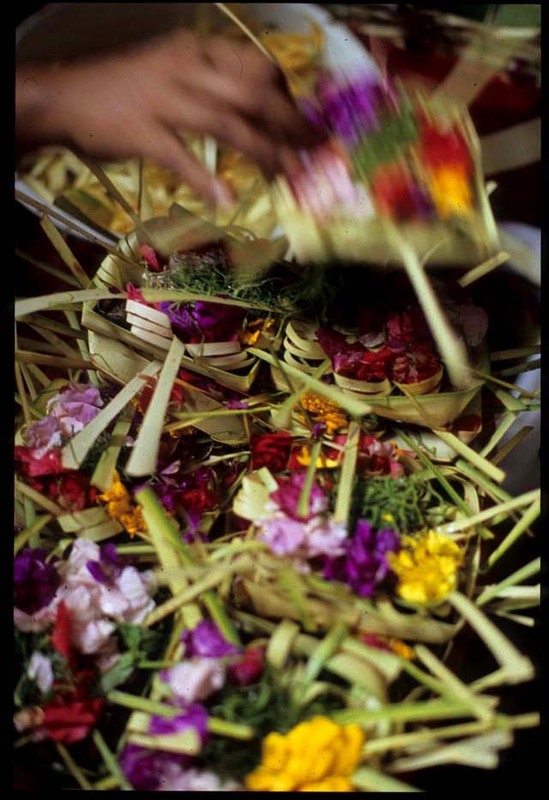 About the only item we found being freshly made were these laklak, a type of jaja (Balinese for rice cake). 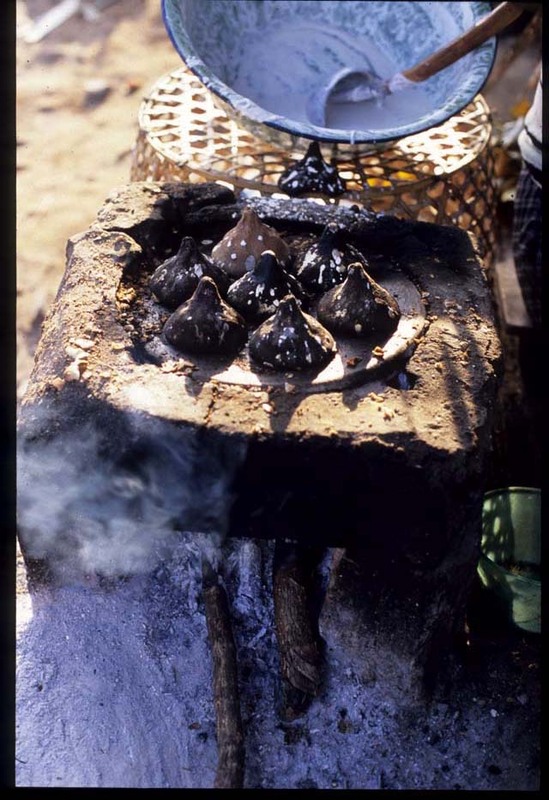 Round, flattish discs of glutinous rice batter, laklak are steamed in a metal mold; the individual laklak 'lids" are made out of clay. 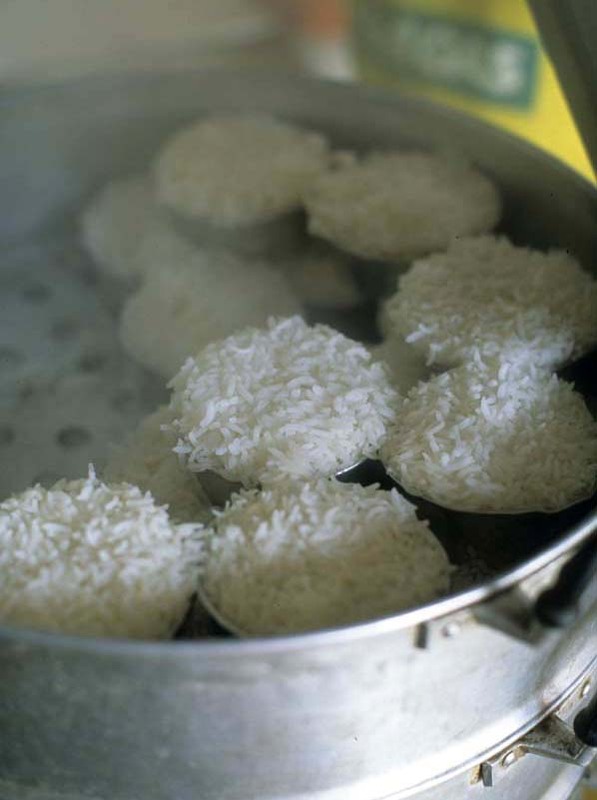 They taste a bit like unfilled Malay putu, and can be eaten on the spot, hot out of the steamer - but are infinitely tastier taken home and enjoyed drizzled with melted palm sugar and sprinkled with freshly grated coconut. To get to this market we left our accomodation before dawn, driving through the dark for about an hour. By 9:30am we were hot and sweaty, tired and hungry, and beginning to turn beet red from the sun. 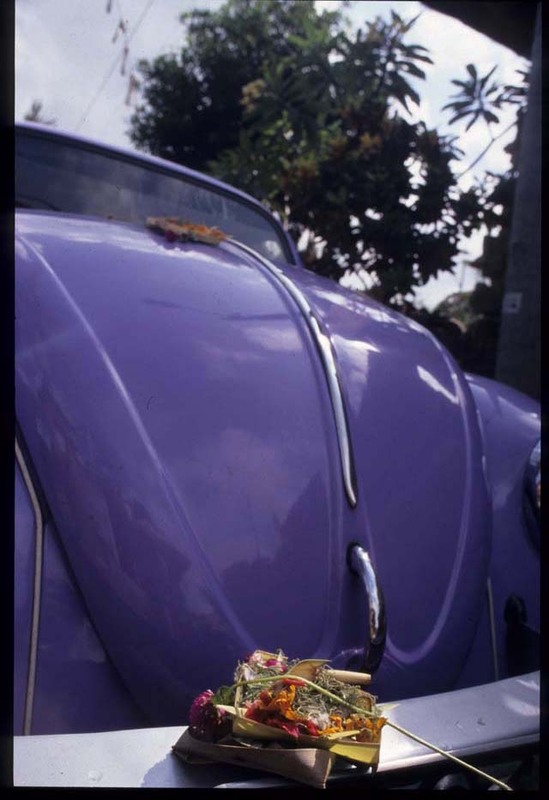 After our umpteenth turn through the streets, we gladly retreated to the car for the long drive 'home'. 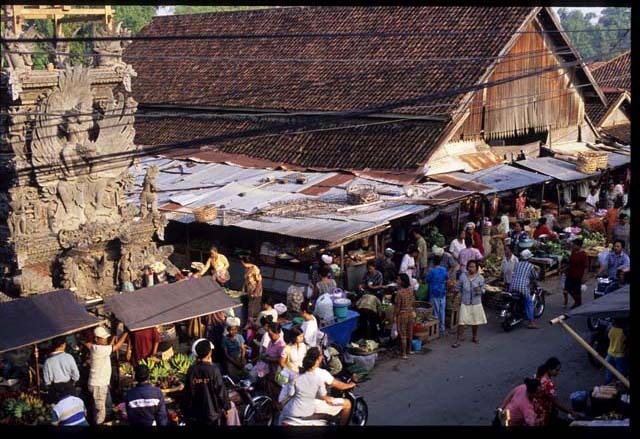 Banjar market, about an hour from Seririt or Munduk on the Kaya Putih-Sererit road, northern Bali. Bubur ayam (chicken rice porridge), seafood market, Jimbaran, Bali. In the Land of the Gods, Do the Gods Drink Coffee? 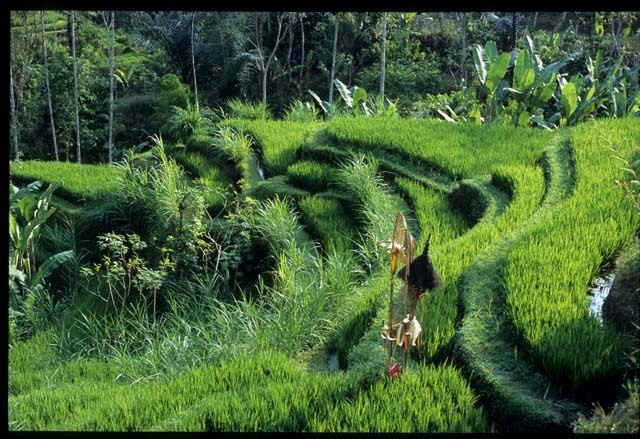 The word 'Bali' is most likely to bring to mind an image of beautifully undulating rice terraces set in a tropical paradise. 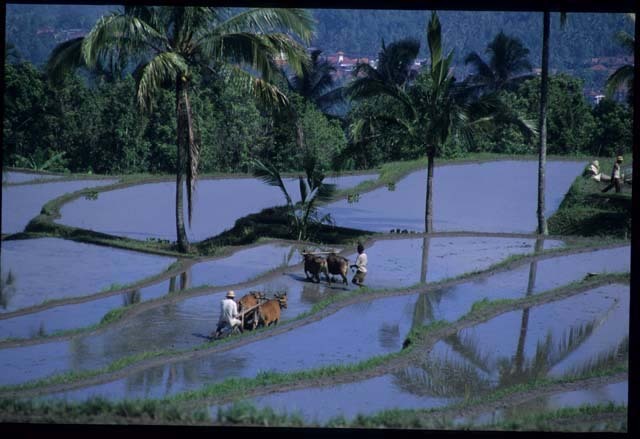 Not surprising, since the island's predominant form of agriculture is wet rice cultivation. 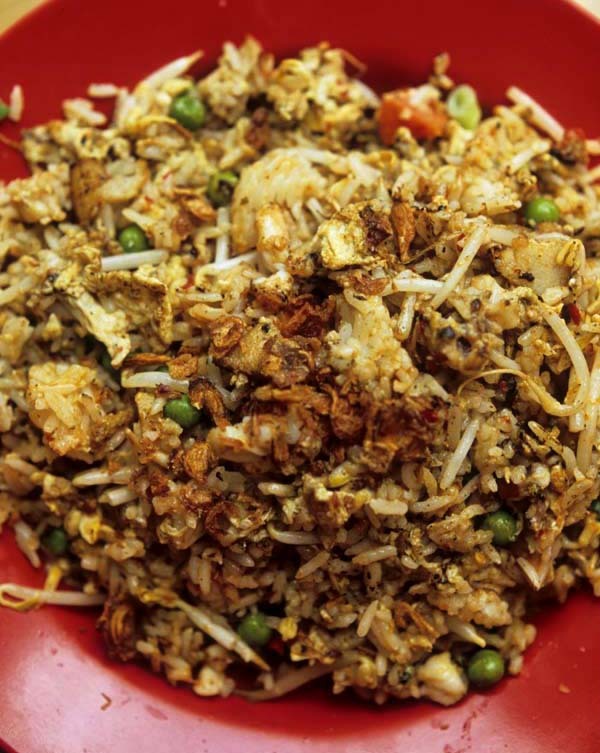 But rice isn't the island's sole agricultural product. In the east and north most hills are carpeted not with paddies, but with trees. 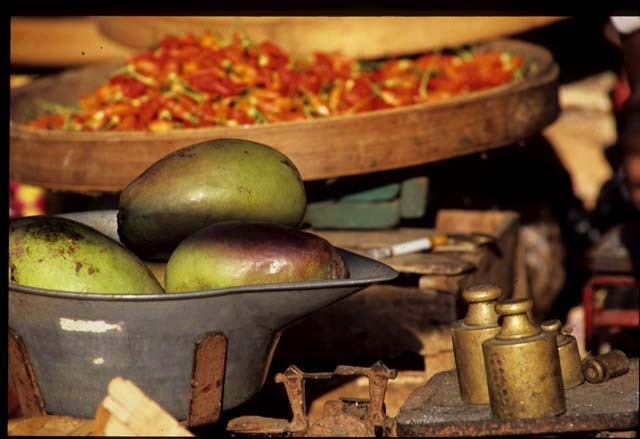 Fruits like mangosteens, rambutan, mangoes, and durian thrive in these cooler, higher altitudes, inland and away from the humid coasts. 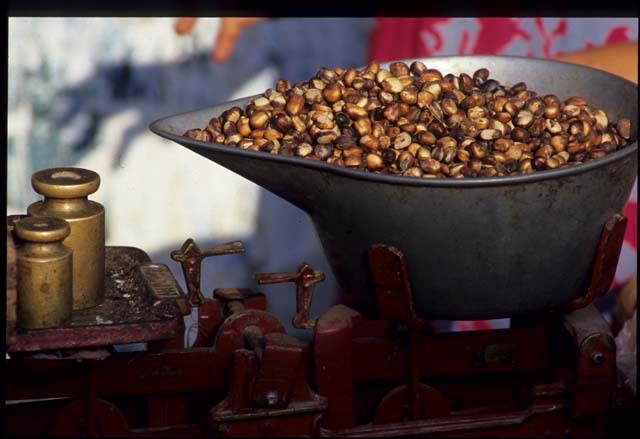 It's a climate that's also perfect for growing cloves, nutmeg, cacao, and, especially, coffee. 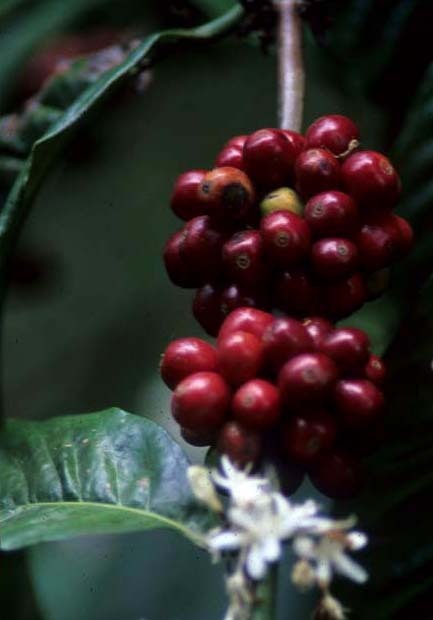 Until recently most coffee grown in Bali was the high-yield, low quality Robusta variety. 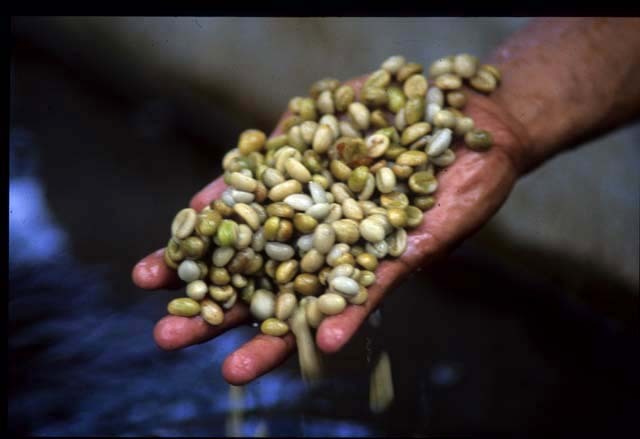 More recently Balinese coffee growers - some large plantation owners, but mostly independent smallholders - have been planting Arabica trees and refining their processing methods in the hopes of producing a superior bean that will command higher prices. We visited the coffee farm of just such a smallholder, in an idyllic spot about an hour's drive inland from Lovina beach, on the north coast. Like many smaller Balinese producers, he grows organically by default; when weighed against the price per bag he's able to get for his coffee, the use of expensive pesticides just can't be justified. 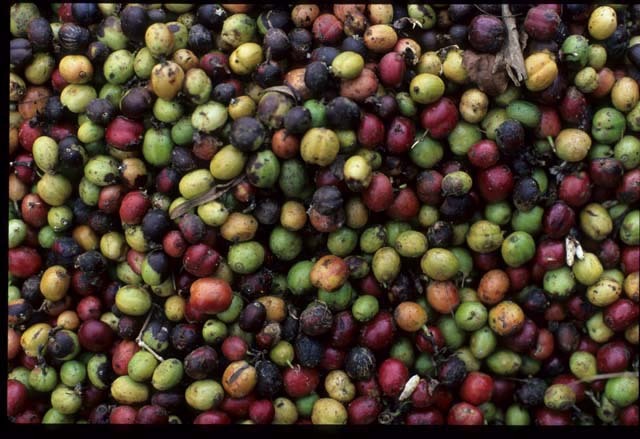 His farm is relatively small, so coffee cherries (the fresh fruits are referred to as 'cherries'; they're 'beans' after they've been dried) are harvested by hand. After they're picked over and poorer quality fruit discarded, the cherries are processed by the 'dry method' - laid out under the sun on a large, flat area of concrete. 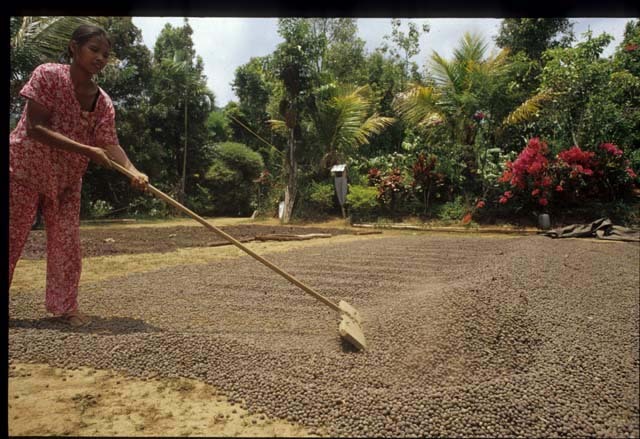 To ensure even drying the coffee is raked several times a day. 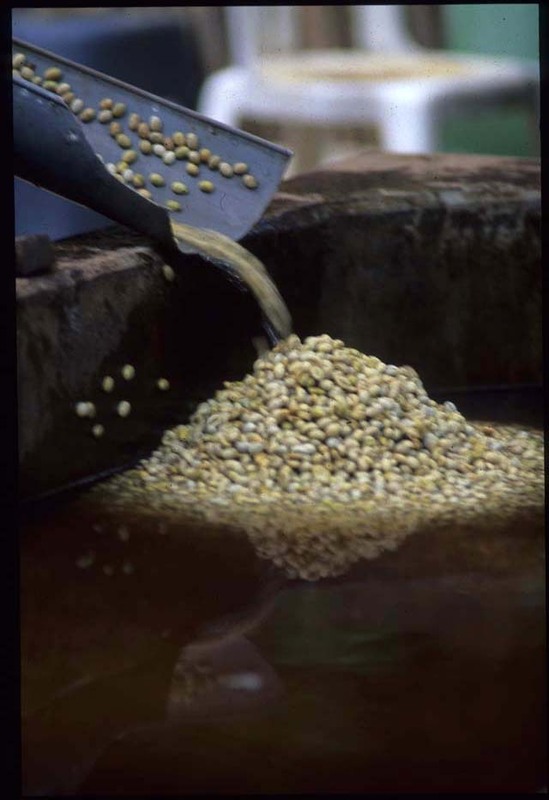 The dried beans are picked over again, and then given a bath. Dry again, they're ready to be shipped. For this grower, the hope is that the quality of his beans will attract the interest of an overseas specialty buyer, preferably one willing to work with him over the course of a few years to improve his product's quality. If not, he'll either sell them to a middleman or transport them to the town of Munduk, a half hour's drive away, to be finished off at the local roaster's facility. 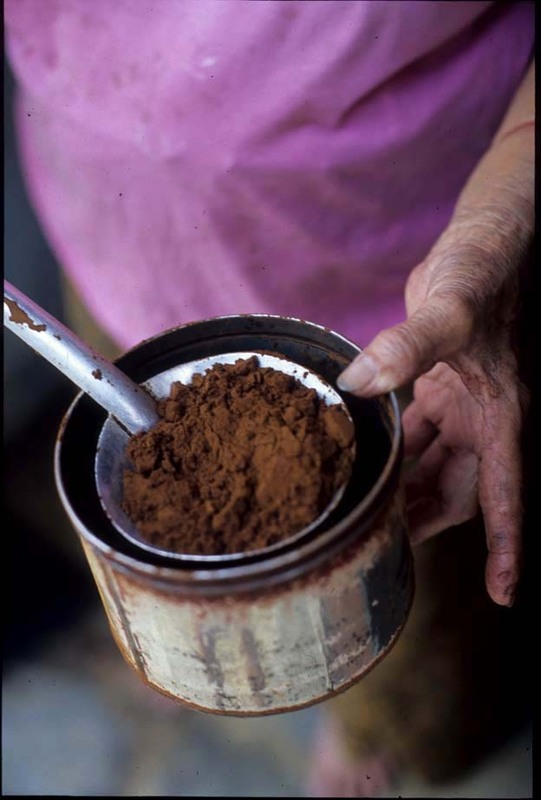 Balinese like their coffee ground extra fine, to a talcum-like powder. 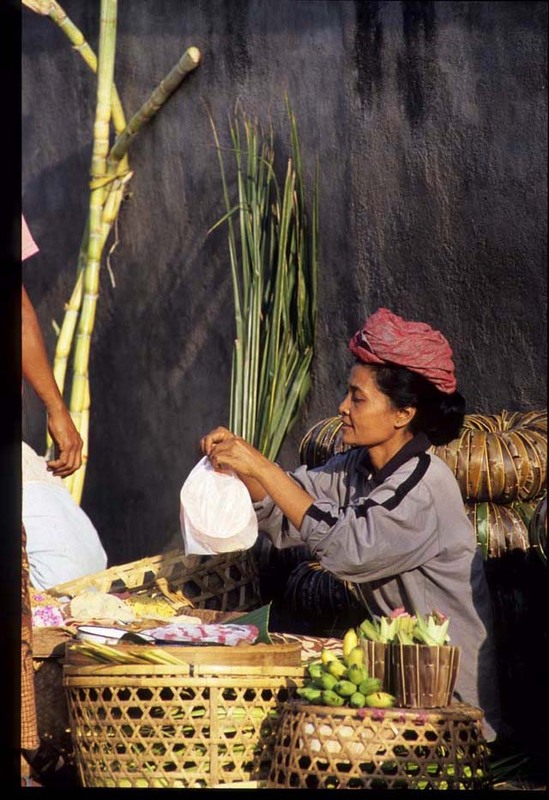 It's prepared as coffee is on other Indonesian islands: without a filter, simply a spoonful or two stirred into a cup (or more spoonfuls, into a pot) of boiled water. After three or four minutes, when the grounds have settled to the bottom of the vessel, the coffee's ready. Sugar is common, milk (canned, sweetened condensed) less so. So, do the Balinese gods drink coffee? If they don't, they should. The coffee gifted to us by this grower's family was superb. Balinese coffee, if grown and processed with care and a lot of skill, is mellow and fruity, with a good amount of body. 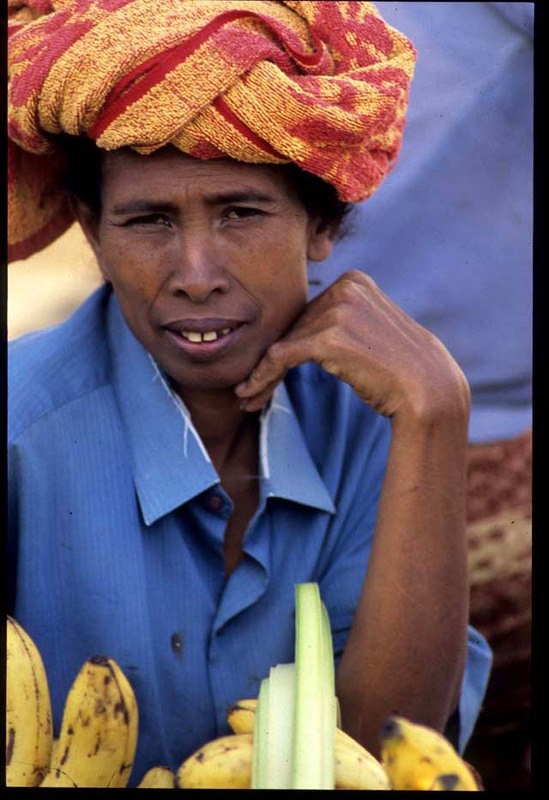 Though they produce a brew nowhere near as robust as that of other Indonesian beans (eg. Sumatra and Sulawesi), Balinese beans hold their own. If you happen to find yourself in the one-street town of Munduk - well worth a visit whether or not you're a coffee fan - ask around, and you'll be directed to the roaster's hole-in-the-wall shop, where you can pick up 500-gram bags of local coffee, whole-bean or freshly ground. 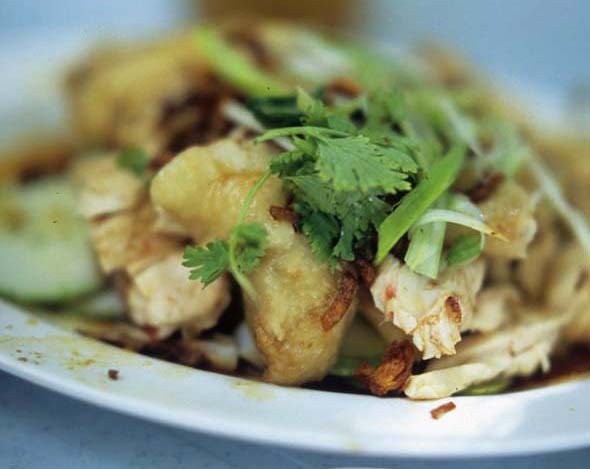 Every neighborhood should have one: a Chinese restaurant that serves dependably de-lish food. I'm not talking about food that will knock your socks off, razzle-dazzle, bring on a swoon, or prompt you to swear you've come within an inch of heaven. And I'm certainly not referring to dishes that incorporate rare and expensive ingredients like swallows' spit, diver-caught shellfish, or the navigational/flotational apparatus of some big fish. 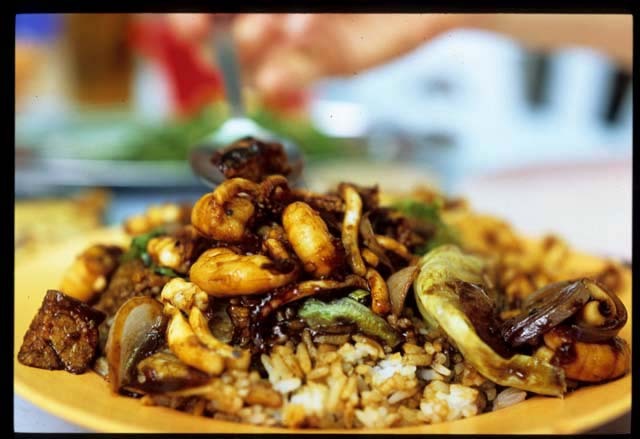 What I've got in mind is Chinese tucker, grub,vittles -- simple, home-style dishes that taste like they've been done a thousand times before, tossed in the same wok and stirred with the same spatula, by the same cook. In Kuala Lumpur, you'll find it in Brickfields, at Sin Kee. This is the place to order that scary staple of American strip-mall Chinese eateries, egg foo yung. It's nothing like the brownish goo-submerged egg puck that was always a component of our Sunday Chinese takeout orders when I was a kid. 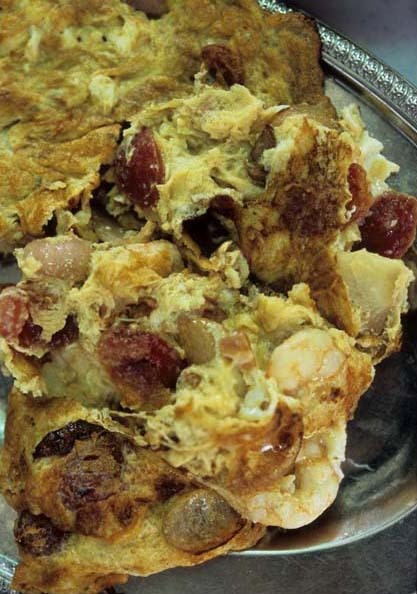 This egg foo yung is, mysteriously, just an omelette. But what an omelette! Flash-fried, it's crispy and beautifully browned outside, tender and crowded with small shrimp and slices of Chinese sausage inside. A tad greasy, perhaps (hard to avoid when fatty-but-luscious Chinese sausage is part of the mix), but there's not a droplet of brown goo in sight. 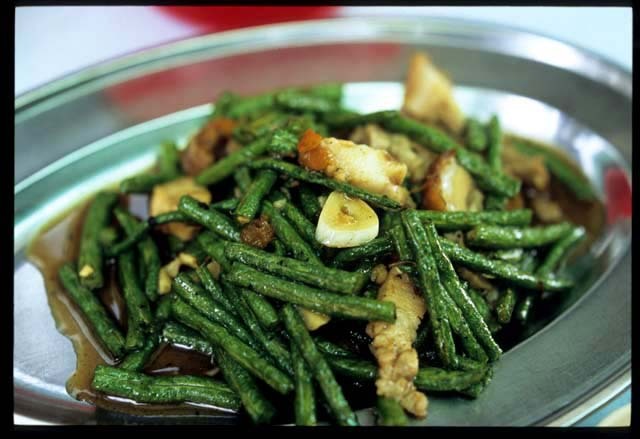 Chinese pork and beans (long beans stir-fried with pork) are flecked with bits of wok char and fragrant black pepper. 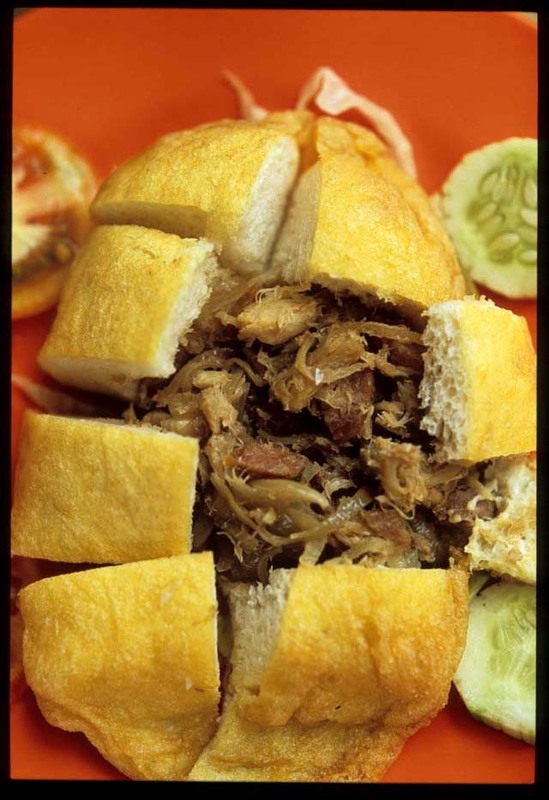 The saltiness of the thick slices of 'three-story' pork (skin, fat, and meat) is a fine match for hefty chunks of garlic (no dainty dice here); the wrinkled beans bend, yet retain a bit of crunch. 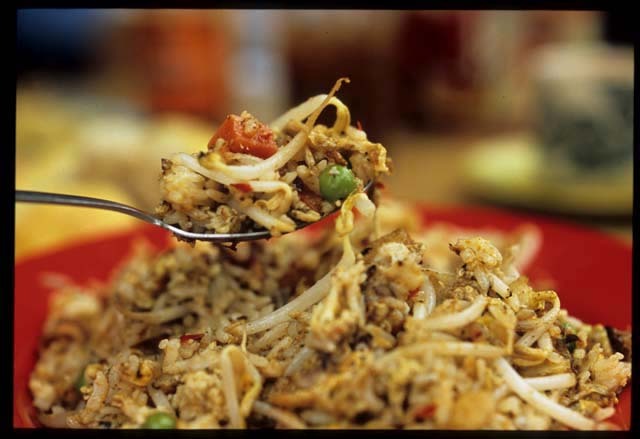 The dish arrives in a shallow pool of thin meat juices intermingled with seasonings, just enough to anoint a spoonful or two of rice. Seafood steamed rice is mom food of the highest order. It arrives at the table as a black-stained bed of fluffy white grains crowned by an inverted plastic bowl. Lift the bowl (top photo) and out tumbles a thoroughly appetizing, black soy-soaked mix of shrimp, squid, fish cake slices, egg, barely wilted head lettuce, and onion. If presentation were everything this dish would already be a winner. Happily, flavors live up to the visual come-on. The seafood's unmistakably fresh, the onions soft and caramelly, lettuce barely wilted. All are complemented by the soy's light sweetness. Forget futzing about with chopsticks; you'll want to use a big spoon with this one. The menu at Sin Kee isn't more than a page long, but it looks promising. In addition to various steamed and fried rices and your standard pork-and-X stir-frieds, there are a few preparations of whole fish. Noodles can be had as well. A fine Chinese joint if ever there was one. Restoran Sin Kee, Jalan Tun Sambanthan (about 2 blocks from the monorail station, turn left as you exit), Brickfields, KL. Closed Mondays. 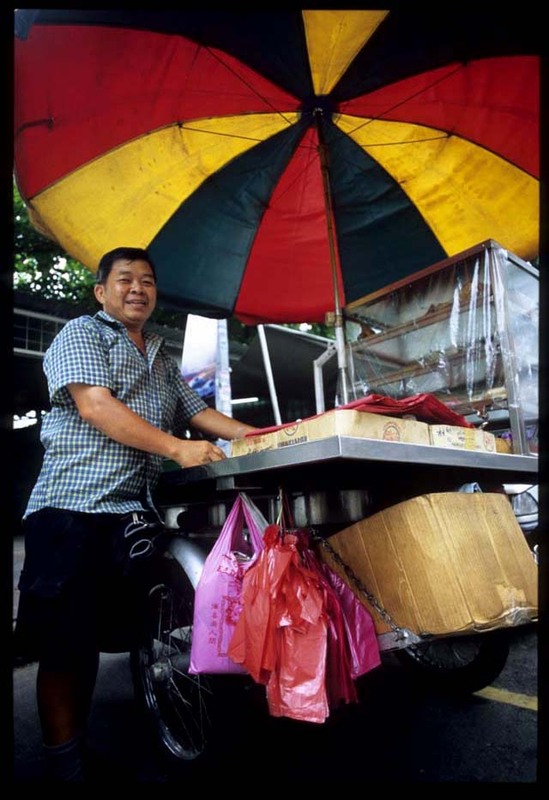 Ng Kok Liang has been cruising the streets of Kuala Lumpur's Pudu area for twenty-two years, dispensing smiles and good health - in the form of Chinese sweet soups - from a motorcycle-drawn cart. Ng peddles tong shui (lit. 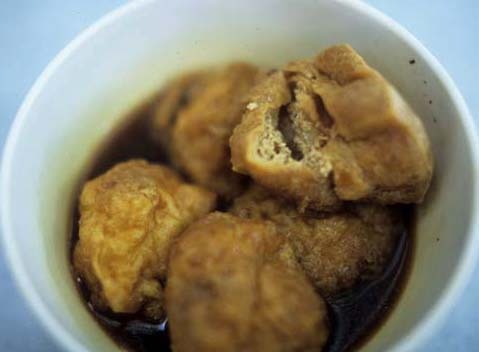 'sweet water' - syrup), a type of food known in Cantonese as yun. 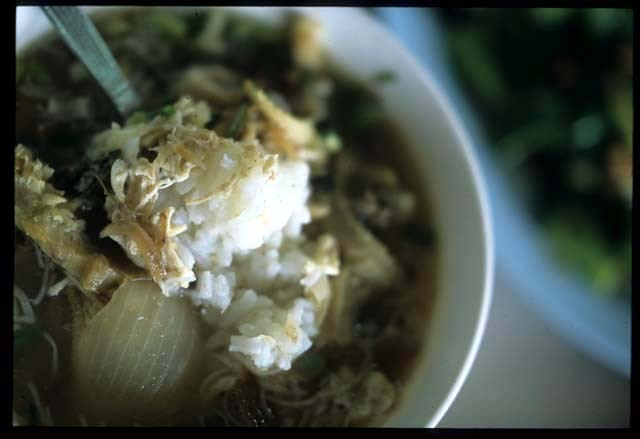 ** Yun are soothing foods meant to restore the body's balance in the event of illness, or after overindulgence in yang (warming, often fatty and/or spicy) or yin (cooling) foods. 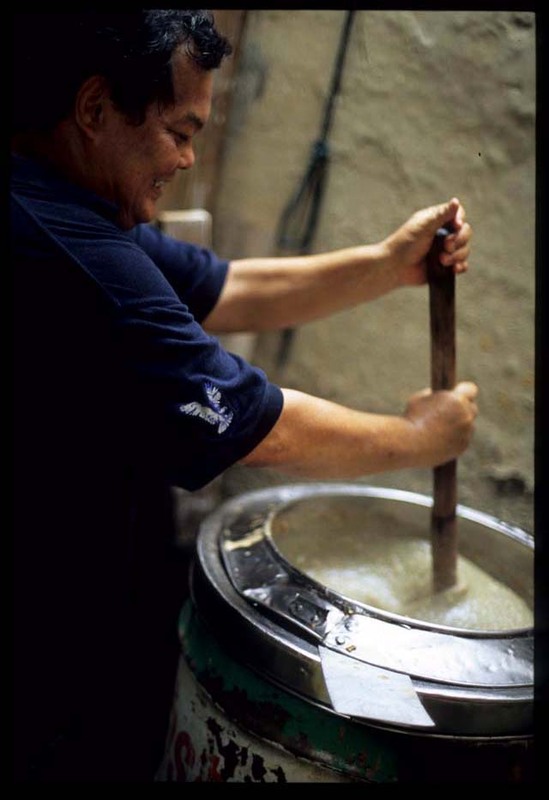 Most yun are soups; congee or jook is probably the most well-known yun outside of the Chinese diaspora. Many yun are as sweet, or sweeter than, any Western dessert. It's 2pm and already Ng's deep pots of snow fungus soup ("good for people who are always sick") and hong dou sha, or sweet red bean soup ("very warming") are empty. We have a choice of sweet potato and coconut soup ("This tastes good but it's not good for you. But customers like the coconut.") or huasheng hu, peanut soup. Mr. Ng. advises that the latter is good for the lungs, a must for smokers. We're not in need of lung therapy but opt for peanuts over unhealthy coconut oil. Ng dishes up a small bowl and we sample it standing next to his cart. The soup is thick and smooth, as sweet as it is peanuty, and rich - impossibly rich. It's like drinking liquid peanut butter. The words "sinfully delicious" come to mind, and I find it hard to imagine that this bowl of oily ground legumes, rice flour, and sugar could be anything but detrimental to my health. Wonderful as it is, this bowlful's too much after lunch. But I don't want to hurt the feelings of Ng, who is smilingly awaiting my verdict, so I finish the bowl. 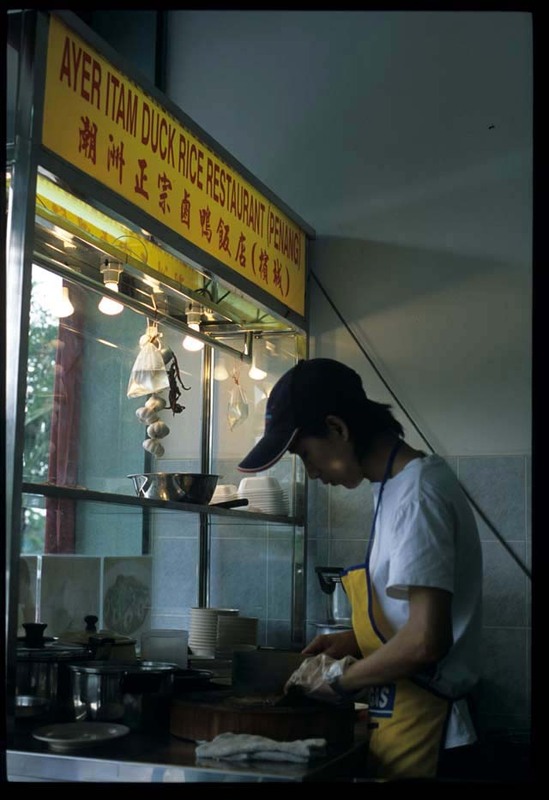 In addition to tong shui, Ng offers various cakes and biscuits (banana, lotus seed paste) and leaf-wrapped zongzi (glutinous rice flour dumplings). He can be found on the streets behind Berjaya Times Square shopping center. Monday through Friday he sets up shop, at lunchtime, on Changkat Thambi Dollah. He also takes special orders and makes deliveries. Tel. 016-381-6212. **For more on Chinese yun and healing foods see Grace Young's The Wisdom of the Chinese Kitchen - delicious recipes and a great read. Kuak Nyuk Loong, a dimly lit shotgun shack practically stapled to the wall of an aging building, doesn't advertise its presence. One gets the feeling, what with the sign prominently displayed inside the shop (and thus barely visible from the street) and the camouflaging forest of potted trees and bushes placed at the perimeter, that this operation isn't looking for fresh customers. It doesn't need them, as we learn on a recent Sunday afternoon. This part of Kuala Lumpur, a pocket of surviving colonial shophouses at the edge of a forest of office towers, is eerily deserted on weekend days, yet there's a steady stream of cars jockeying for position outside KNL's entrance. At 2 o'clock this somewhat stuffy venue is still heaving with customers, and the staff are taking and filling eat-in and takeaway orders at warp speed. The reason? Have a gander up top. Kuak Nyuk Loong is fish ball HQ. In general I'm not a huge fish ball fan. Oh, I can appreciate the artistry involved in crafting a pleasing piscene orb that doesn't bounce like a Super Ball or smoosh like a marshmallow. I don't have anything against fish balls. I just don't crave them. Until now. KNL's balls are a revelation. Note the texture, the shallow dimpling and stippling that tells us that these globes are made by hand rather than machine, from food instead of food products. Firm and springy yet - somehow - at the same time soft and almost fluffy, these tasties boast a fishy aroma that screams "fresh!!" They arrive in a light but not at all weak chickeny broth, ten to a bowl. And they grace every table in the joint. The limited menu here is a bit of a hodgepodge. 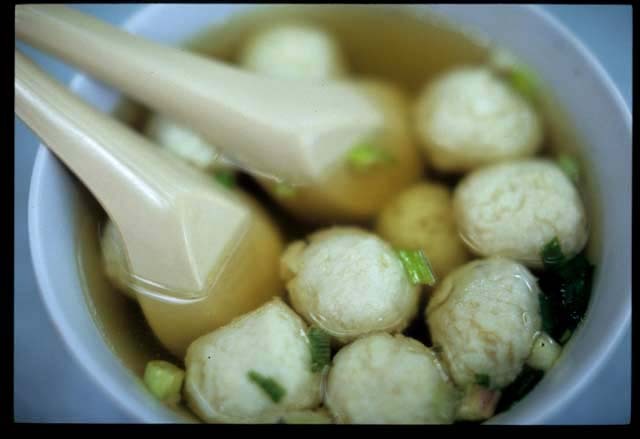 Most patrons, when they're not bobbing for fish balls, are slurping from plates of 'dry' (rather than soup) noodles in garlicky, greasy (lardy, perchance?) soy sauce. 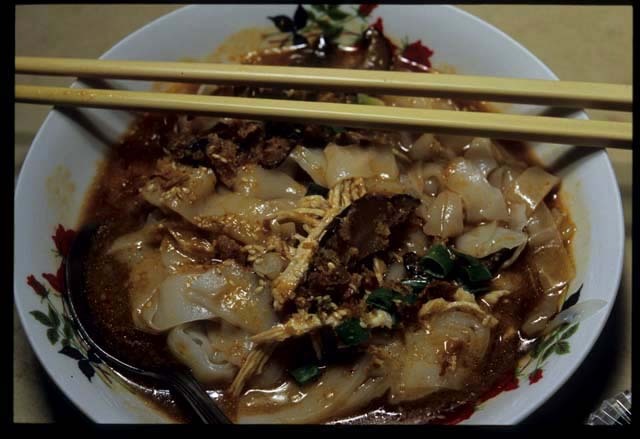 Kuey teow (semi wide, flat rice noodles) are popular but we're told they're sold out (as we leave we observe a huge pile of kuey teow in the glass case - what's up with that?) and settle for a mix of yellow mee and meehoon. Capped with a generous mound of browned shallots, the dish is a shoveller - especially when charged up with a hit of the house's hot and limey (if alarmingly neon-hued) chili sauce. yong tauhu, firm tofu stuffed with a pellet of tasty fish paste and deep-fried. These thick-skinned, chewy soybean squares are inexplicably absent of grease. Served in a warm soy-based sauce, they're juicy little numbers - not soggy, but soaked through. En guarde, for every bite is accompanied by a potentially shirt-staining spurt. Come for the balls, stay for the tofu. And then another order of balls. Not the easiest eatery in KL to find, but well worth the effort. Update: This stall is closed and, as of September 9, 2006 the building and its neighbors was in the process of being demolished or rehabbed, not sure which. No word on if the shop has reopened and, if so, where. Sorry! Kuak Nyuk Loong, Jalan Raja Abdullah at the corner of Jalan Yap Ah Shak, 1 block from Jalan Dang Wangi. Morning till around 3. Closed Mondays. 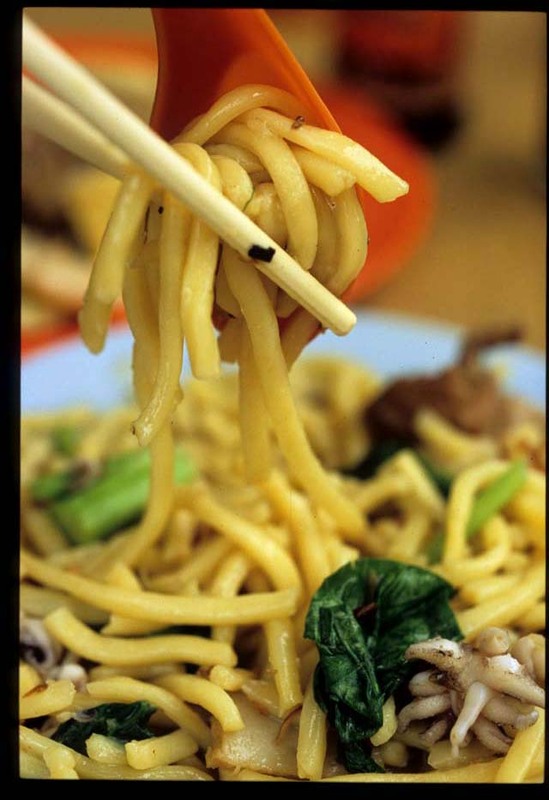 A casual search of my (or this blog) tells me that, in Kuala Lumpur, we eat a lot of noodles. 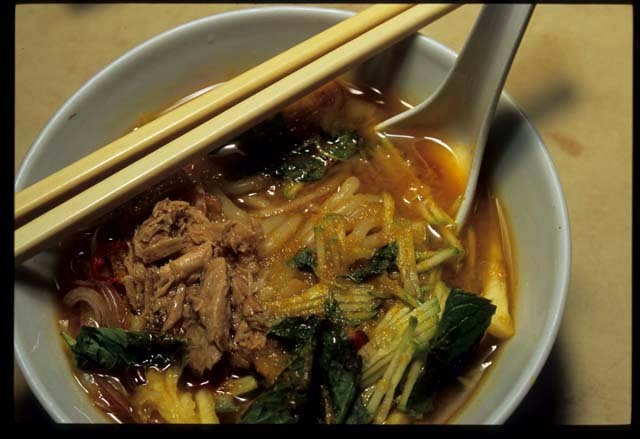 Head out in search of street grub in this city and it's almost guaranteed that noodles - souped up or stir-fried, sauced or plain, lardy or low-fat - are what you'll find first. 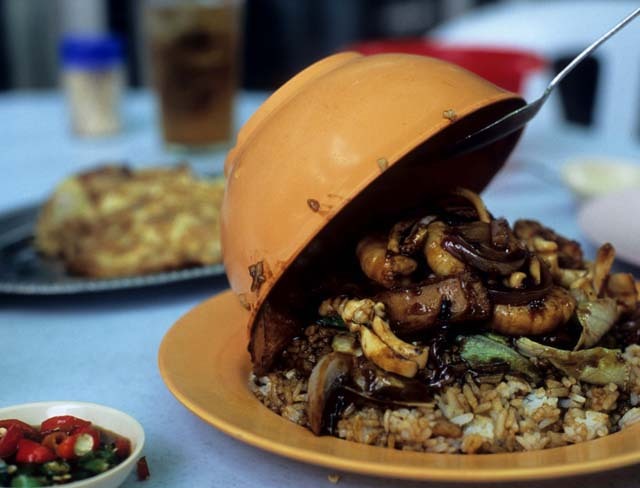 Not so in Kota Baru, capital of Kelantan, the northeastern Malaysian state known for its rice dishes. Though there are certainly noodles to be had here (especially at any of the city's numerous Chinese coffee shops) rice seems to appear at every turn. 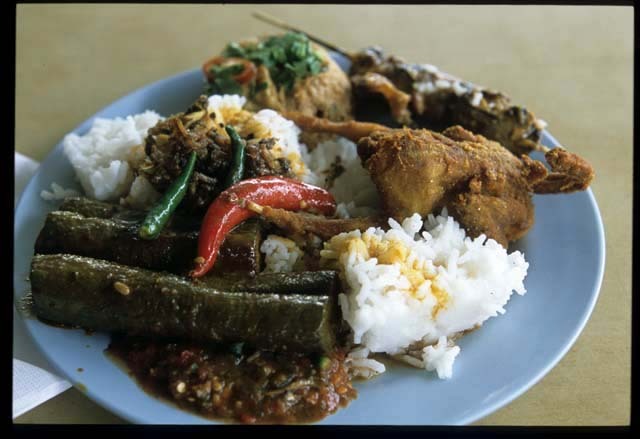 Blue-hued nasi kerabu and coconuty, semi-polished nasi dagang come immediately to mind, but these aren't the only rice options on offer. 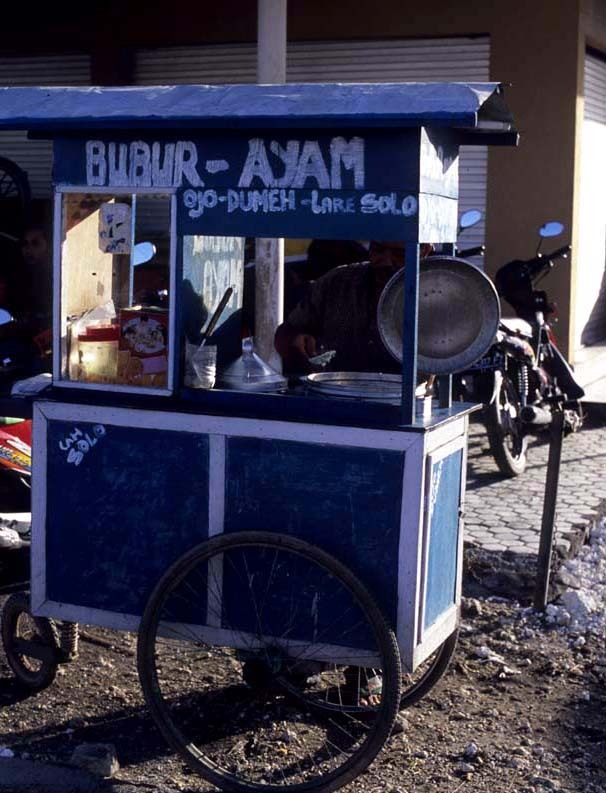 Zakini Nasi Kukus, an airy shop on the northern edge of town is the place to go for nasi kukus (steamed rice). 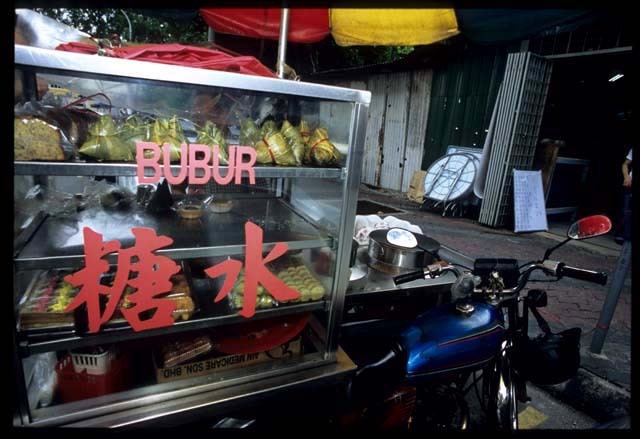 This husband and wife-owned operation, which began life as a 'meals on wheels' cart about twenty years ago, offers individual aluminum bowls of steamed rice, to eat with a huge variety of Malay meat and vegetable tasties. Rice afficianados will appreciate the deliciously unique texture of these grains: puffed, extremely light and fluffy, and elongated to the point that they curl just a bit at the ends. We came for the rice but stayed for the amazing array of flavorful dishes. 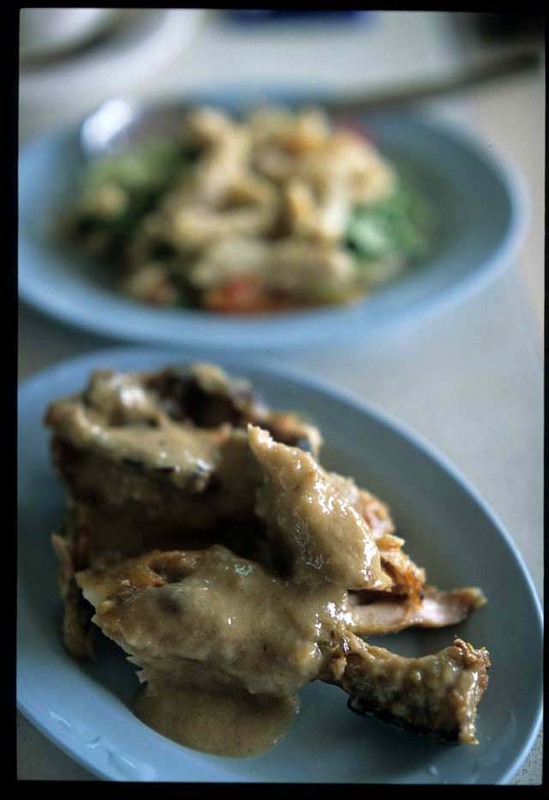 The 'airiness' of the steamed rice means it is extra absorbent, just the thing to accompany (clockwise from 12 o'clock) a crunchy outside-moist inside potato 'cake', liver sate, deep-fried quail, and tender but not mushy eggplant in a complex, spicy sauce. But why stop there? (We didn't.) 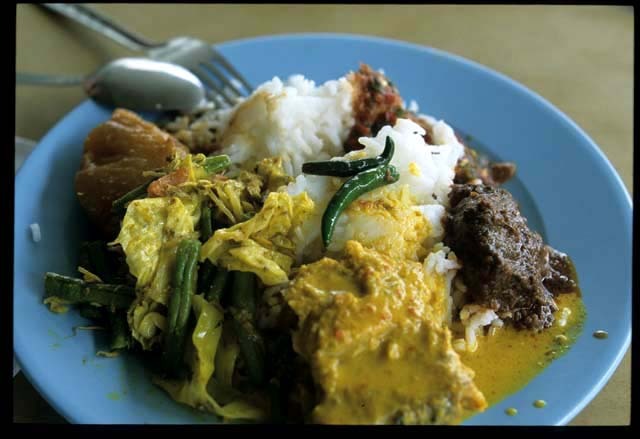 Especially when (clockwise from 3 o'clock) there's also chili-rich, coconut-free goat curry, mild boneless fish simmered in coconut milk, and a turmeric-scented stir-fry of cabbage and long beans to be had. Of special note is Zakini's sambal (pooled at the bottom of top plate): a textured, limey, not too fishy but plenty fiery pounded mixture of fresh green and dried red chilies. Zakini Nasi Kukus, Jalan Wakaf Mek Zainab, on the north side of the street about halfway between Jalans Atas Banggol and Kebun Sultan, Kota Baru. 11am-ish to 11pm. Nasi air (lit. 'rice water') is Kelantan's version of rice porridge and, though it's available all over Kota Baru, cavernous Mak Su Nab is - we were told by a desk clerk at our hotel - the place to sample it. This nasi air - a loose and soupy rather than thick 'n creamy porridge - is a delightful bowlful of distinct, soft-but-not-mushy grains of rice, skinny rice noodle threads, finely shredded chicken, bits of cow stomach, and the barest strips of fried tofu, all in a full-flavored meat broth garnished with fried shallots and chopped scallion. What makes this porridge distinctively Malay (as opposed to Chinese-style) is its subtle hit of savory and sweet spices - I could detect cloves, cinammon, nutmeg, and black pepper, but I'm guessing there's much more to the spice mix than that. 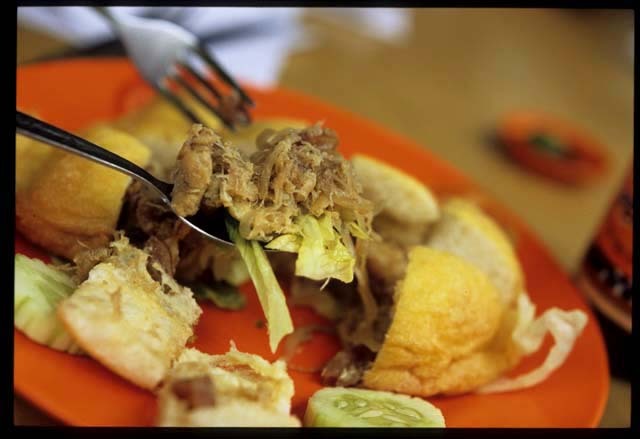 Nasi air is Nak Su Nab's raison d'etre, but its menu is surprisingly long and varied. We sampled kailan ikan masin (Chinese broccoli stir-fried with fragrant kecap manis and chunks of salted fish), kerabu perut (a bracingly limey and spicy cow stomach 'salad'), and ayam percik (grilled chicken doused in a sinfully rich coconut sauce) and judged all to be worthy accompaniments to the main attraction. Mak Su Nab, Jalan Hospital (south side of the street, east of the General Hospital), Kota Baru. 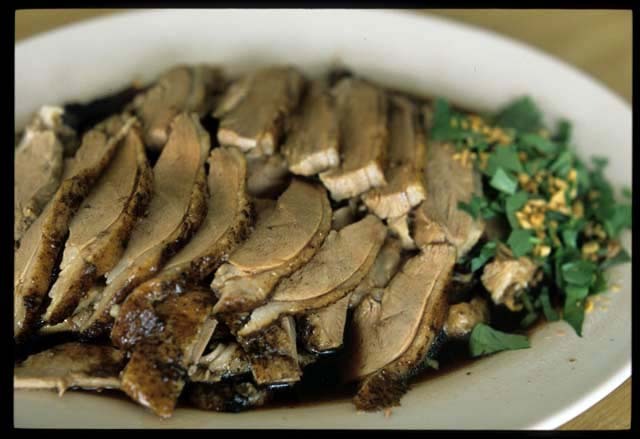 "Genuine Chaozhou Stewed Duck." Or so claims a sign in this spit and shined, squeaky clean little shop in Sri Muda/Shah Alam. Now, I'll admit right up front that what I know about the cuisine of Guangdong province's Chaozhou (aka Teowchow, aka Chiuchow) you could fit in a shot glass, so I'm in no position to judge authenticity. But delectable, yummy, luscious - all these I know, and know well. Any and all of these adjectives accurately describe the fare at Ayer Itam. First up, the restaurant's namesake: duck rubbed with spices and stewed until it's falling apart tender, beautiful boneless mini slabs served in a pool of warm, lightly soy-seasoned broth complemented by a palate refresher of spritely, bitter Chinese celery leaves and toasty fried garlic. This hillock of meat is meant to be eaten with rice, but quite frankly I opted to leave the white stuff aside and devote my attention to the quack. 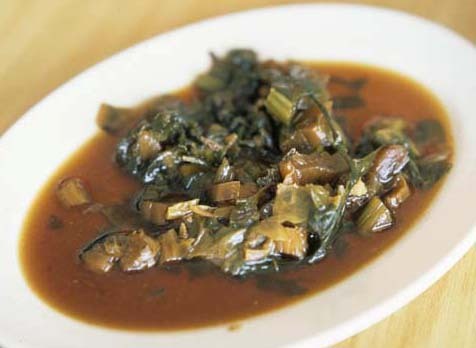 On the side, a Sinicized version of (American) southern-style long-stewed mustard greens. These meltingly soft stems and leaves with the odd piece of pork are seasoned hot and sour (more the latter than the former) and go down easy. I could eat a bowl of these velvety stems and leaves just about everyday. Meicai (if my tin ear caught the proprietess' pronunciation correctly) is a variation on the greens theme: more mustard, but in this case the vegetable is slow-cooked in broth, soy, and a spice combo that hints at anise and cinammon. Meatless and evincing a bit more toothsomeness than its hot and sour relative, this dish o' greens is nonetheless equally delectable. Ayer Itam has been open just over half a year. 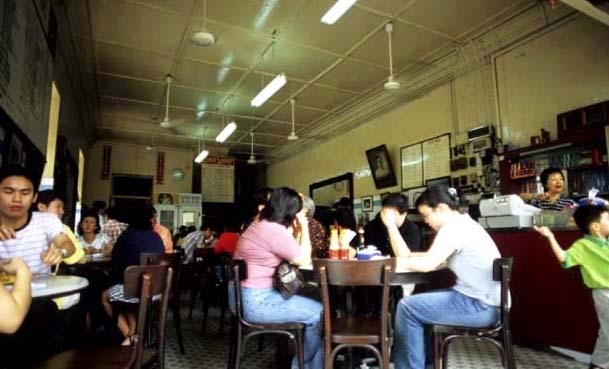 Owners Ann and her husband hail from Penang (also known -to Malaysians anyway - as 'street snarf central'), where her grandfather opened the original Ayer Itam Duck Rice Restaurant years ago. 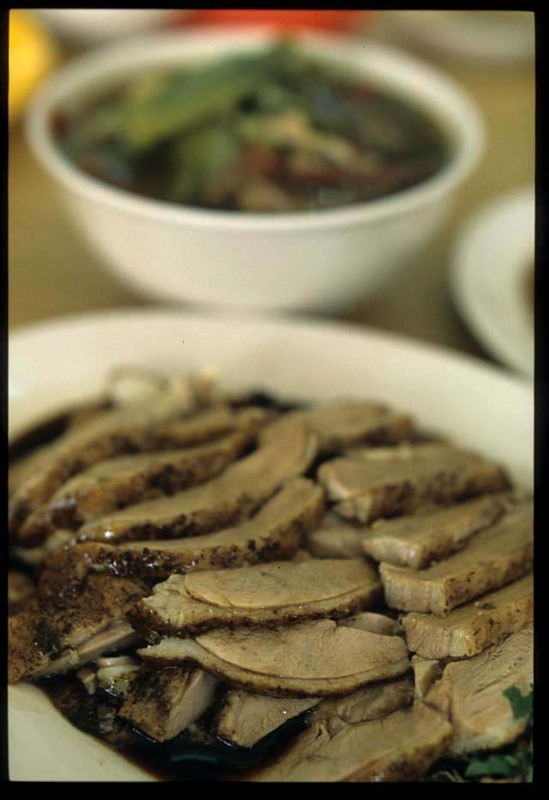 The menu extends beyond duck rice to include other, primarily pork and tofu-centric, Chaozhou favorites. If there's any justice in this world we'll be heading back soon to sample every last one of them. 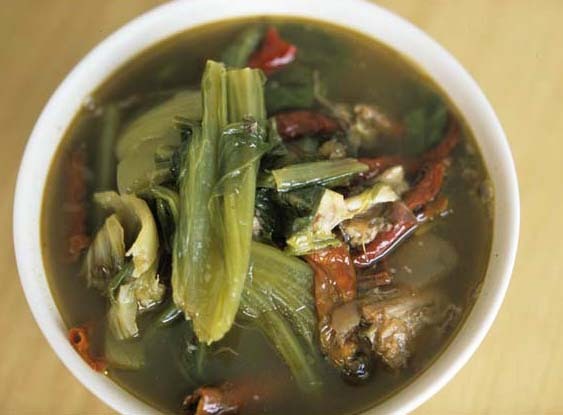 Note: I really would eat those hot and sour mustard greens everyday. If anyone can point me in the direction of a recipe or a place closer to KL where I can dish 'em up or da pao I'd be most appreciative. Ayer Itam Duck Rice Restaurant, No. 8 Jalan Sepadu B 25/B, Seksyen 25, Shah Alam. Tel. 016-358-2711.